The Falcon Spider FS420 is one of the newest and most robust narrow access units available. 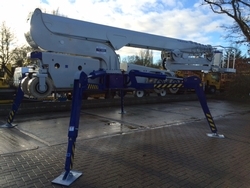 Designed to meet the most demanding access tasks that modern buildings might require, the unit fits through a narrow doorway of only 0.9m, can raise men to working height of 42m and has a telescopic boom with articulated jib that gives access to the most difficult to reach positions. Can be used internally and externally. Battery powered with non marking tyres.